Nothing is more fun than going to a Renaissance fair where you can dress up in your favorite Renaissance-era costume. The Renaissance period, which spanned roughly the 14th to 17th centuries, allowed women of that time to flaunt a wide variety of ornate fashions, with typical outfits consisting of multiple pieces (including underskirt, skirt, hoop, bodice, over bodice and collar) and were made of heavy, rich fabrics such as silk, velvet, brocade and cotton. Most Renaissance fairs, however, feature beautiful women costumes and dresses dating back to the Elizabethan period which lasted from the mid-16th to the early 17th centuries, although women participants still have wide latitude in picking which outfits they will wear. 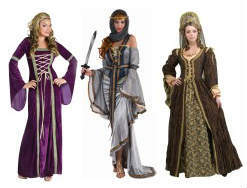 The most popular Renaissance festival dresses and costumes include those which are inspired by historical figures such as Queen Isabella the first of Spain and Anne Boleyn (the second wife of Henry the eighth). The Queen Isabella costume is made of pewter-colored satin and features authentic details such as puffy sleeves and ornate trimming. It is available in adult plus sizes (18-22). The costume also comes with a crinoline underskirt and a period headpiece. The Anne Boleyn outfit consists of a brown and orange dress with a lace-up bodice trimmed with gold and a matching headdress. It is available in small, medium and large sizes. Of course, not every woman who lived in the Renaissance period was nobility and there are a wide range of lighter, sexier styles available for those who would like to go as country or tavern wenches. The country wench costume features a white chemise, black lace-up bodice and eggplant-colored gathered skirt which laces up in back. The tavern or serving wench outfit consists of a white peasant blouse, black halter corset trimmed in gold, crimson skirt that gathers at the side, and a mop-style cap. Finally, Renaissance fairs are also open to legendary characters such as Maid Marian. The Maid Marian costume consists of a light blue velvet gown with an ornately-decorated bodice and a matching blue and gold headpiece featuring a sheer organza veil. These Renaissance faire costumes give me a wow feeling whenever I see them. Theyre just awesome. The Shakespeare’s Juliet Costume is my favorite one.